Richard Lico (@Foofinu) is animation director at startup studio Polyarc and has an impressive history working on successful games, (most recently the colossal Destiny), as well as years as an online game animation instructor. He is currently creating VR game Moss with a group of ex Bungie veterans, featuring a beautifully animated mouse. So first up, please tell us the story of your career so far. Of particular interest is why you’ve made the leap from big AAA games to indie, while still producing fantastic animation. I grew up in New Jersey, where console gaming was rooted just as deeply as Whiffle Ball, Garbage Pail Kids, and Big League Chew. When I was in sixth grade, The Legend of Zelda had been unleashed upon us. Much to the chagrin of my teacher, I had decided that saving princess Zelda was a more noble endeavor than dividing fractions, or reading about Holden Caulfield. It was a world full of imagination, fun activities, and interesting characters. But unlike film or books, it was a world I could directly affect. Like Super Mario before it, Zelda struck me emotionally. My kid brain knew that someone had to make these games. Someone was paid more than an allowance, but real, adult money to do this. Why couldn’t that be me? I decided to take up art, learning how to draw Mario, Link, Mega Man, etc… Art would be my Trojan Horse. After my publicly mandated schooling had ended, I decided to go to the Savannah College of Art and Design ‘SCAD’ to further refine my illustration skills. It was the mid-90’s, and Toy Story had recently hit theaters, inspiring a generation of young minds to ponder where this amazing, new form of computer-animated storytelling could take us. Many focused on what computer-generated 3D meant to film. I was busy imagining how it could vastly alter future games, and the characters who inhabit them. So I promptly changed my major from illustration to ‘computer art’, and earned my degree which guaranteed me a job! My degree didn’t guarantee me a job. After sending my animation reel on VHS tape, coupled with a photo book of my illustrations to dozens of game and film studios, I didn’t find work. Each application packet cost me roughly $10 for the tape, portfolio, prints, custom label, and shipping. For a college grad, this was equivalent to food for multiple days. I decided to move out of Savannah, to the big city of Atlanta to improve my chances. I applied to anything and everything I could. And in January of 2000, I scored my first job as an animator! Doing….. well, doing animation for electronic billboards on the side of interstate 85 for Turner Broadcasting. Spinning logos for TNT and CNN with riveting information such as “Tune in tonight for…”. But, it was work and I was happy to have it. I had access to an SGI workstation, and a copy of 3DS Max. I stayed late often so I could use their equipment to make a short film about the plight of bowling pins. Exactly one year after joining Turner, my bowling pin short caught the attention of a game studio called Sunstorm Interactive in downtown Indianapolis, Indiana. So I left Georgia and moved to a place I knew nothing about, that had a total of 1 game studio in the entire state. Not exactly job security, but it was my open door and I wasn’t going to miss it. We made budget PC games such as Deer Hunter, Carnivores, Bird Hunter, Fire Rescue 911. Essentially, games that were the opposite of inspirational for me. But I was learning so much, animating characters, and making games. After a couple years with Sunstorm, I joined my first AAA studio, Ravensoft in Madison, Wisconsin. Over my 2 year tenure there, I grew from an animator to a senior animator. I was able to help design the light saber combat for Jedi Academy and create cinematic performances for Xmen: Legends. This eventually led to my first animation lead role with Monolith Productions in Kirkland, Washington, working on the Condemned and F.E.A.R series. My three and a half years with Monolith provided an immense amount of learning. Using mocap really refined my eye for body mechanics. And being a lead enabled me to understand the bigger picture. But the house that Halo built, Bungie, was actively attempting to recruit me. I managed to resist this siren call for 2 years, before giving into it in 2008. Bungie is an anomaly in the gaming industry. It’s a studio like no other I had experienced. Their laser focus on gameplay is phenomenal. Their focus on the quality of life for their people is inspired. The talent there is incredible. And what I could accomplish with their support behind me was intrepid. I headed up the purchase of our own, internal spandex palace, i.e. ‘Mocap studio’. I helped craft the final Bungie Halo game. I helped define a whole new animation tools pipeline for the studio. Pitched, designed and help implement their Runtime Rig system. Finally, I helped to define, create and support Destiny, an epic world filled with possibility. It wasn’t easy, but it was worth it. Some of my most proud moments in gaming are playable by the massive Destiny community. Bungie is a large studio these days, which wasn’t always the case. When I was hired, we had less than 100 people. By the time I left Bungie 8 years later, we had about 650 people with plans to grow more. This meant that, as a lead at Bungie, my days gradually became less about leading by example, and more about employee reviews, management, scheduling…. All things that deviated from my personal goals, yet were necessary to advance my career. This isn’t unique to Bungie though. Many studios tie success, salary, and more generous benefits to the traditional corporate ladder. So the most experienced or successful animators are often asked to stop animating. After being a lead with Bungie for 6 years, myself and others at Bungie pointed this out to studio leadership. We Illustrated for them the creative vacuum this often generates, and how it would affect our products. In turn, Bungie graciously created the principal role which allowed me to maintain autonomy, scope, benefits, and salary. I was expected to lead by example and help mentor the team, yet not manage or play the role of producer. Bungie’s ability to react to the situation, making a change that benefits both the studio and their employees, speaks to their dedication towards making Bungie one of the best places to work. My 8 years with Bungie were an amazing time, but eventually, I started to crave something new. To look for my next challenge. These feelings were amplified by my 2015 demo reel, which felt nearly identical to my 2014 reel. I knew that if I were to continue to grow as an animator, I needed to tackle something I had never done before. A small group of four friends had been working on two VR game demos in the hopes of going independent. They had quit Bungie, betting on success. I saw this as opportunity to do something new. To continue to grow as an animator. So, in June of 2016, I chose to exit Bungie, and join my friends as the fifth member of Polyarc. Both demos resurrected those old feelings I had playing Mario and Zelda back in sixth grade. The possibilities of VR rekindled that fire I felt after seeing Toy Story for the first time, imagining what 3D computer animation could do. The small team allows me to grow as an artist, much like in my earlier career. And the team is comprised of some of my favorite folk from Bungie. Polyarc really feels like the culmination of where I’ve been, and where I need to go next. You are very open in sharing your animation processes on Polyarc’s first game, Moss. Can you please describe a typical day of work and perhaps how that’s changed over the years? I’m still trying to find my flow at Polyarc as we’re a small, growing studio with big ambitions. Some days I spend my time animating our hero character, or one of the other characters in Moss. Some days I model a low-poly mesh for a new character. Other days I work on our animation pipeline, improving my rigging skills and learning how to script. I often find myself having fantastic conversations with the rest of the team about everything like story, character motivation, design principals, engine tech, or a bevvy of other topics. One of the pillars of our studio’s philosophy is that we’re all game developers. We may specialize in a given area, but we’re all making the game. This means that we all have input in the entire process. We all have the opportunity to learn something new, and help out where it’s most necessary. It’s an amazing experience. We’re also an independent studio financed by investment capital. This allows us to make our own decisions regarding external communications, freeing us up to be as open as we choose. We believe in transparency, and I personally enjoying sharing knowledge. By doing so, we help build a partnership with our potential customer base as well as our peers. This is a different approach than what I’ve experienced in the past on both an external communication and process front. Previous jobs were very structured and my role was clearly defined. As an animator, there was little opportunity to model a character or give input on the story, for example. At larger studios, even within the animator title it could be very specific. Bungie has a 1st person animator role, for example. Many studios are also partnered with a publisher, who generally makes decisions regarding external communication. This often prevents most individual developers from having an industry voice. I feel I can recognise a Lico animation now due to your signature limb movements that convey weight, and often the difference between your keyframe and polished mocap is minimal, yet now you’ve moved over to a very classical style for your mouse character. Do you have a style preference between realism and exaggeration? Thanks! Accurate body mechanics or ‘realism’ is a passion of mine. I focus on it as a way to help create a unique look, so I’m really happy to hear it’s working. But I’ve found accurate body mechanics in animation to be really difficult. It’s certainly been my biggest personal struggle with animation, and I’m guessing the same would ring true for others. To help, I’ve focused on creating workflow techniques for myself that make accurate body mechanics much easier to achieve with a simplistic rigging process. For example, my animation rig has a completely different setup when doing core posing than when tweening. And even while tweening, I’ll often use a bevy of space-switching tricks to data-mine existing motion, information from reference, or physics simulations to help achieve all the little detail in the body. This process eliminates the need for mocap, though I still enjoy using mocap for the amount of time & effort it saves. With our mouse, I’m still trying to get all that texture and accuracy of proper body mechanics, but mix it with the style of classic Disney. I really love the sketchy, physical, yet super-expressive work from the Jungle Book and 101 Dalmatians. The 9 Old Men were able to really push that exaggerated aesthetic while also showing exquisite detail like how a hip reacts when the foot plants. By taking inspiration from them, and mixing it with textured body mechanics, I’m hoping it’ll result in a lot of appeal. So for me, instead of it being a decision to do either realism or exaggeration, I’m trying to merge these styles into my own thing. To evolve my own personal style. As an educator and online instructor for some time now, you have always been forthcoming about sharing your gained knowledge in videos and tutorials. Why do you feel you’ve always made time to help and train up fellow and upcoming game animators? When I was promoted into my first lead role at Monolith back in 04, I was a terrible lead. I was protective of knowledge. I saw leading as an opportunity for me, rather than an opportunity for the team. I was too young to properly handle the responsibility, and lacked the knowledge to do so. I felt insecure and defensive. Over the next few years, I began to understand what a leader should be. My manager at Bungie, Roberta Browne, was a huge mentor for me in this area. I was educated on the value of putting the team first and sharing knowledge. The team’s success became my success, and the team responded in kind. It was a change in mindset that allowed me to understand the bigger picture. These days, I see the gaming and animation industries as a team. We may be competitors in some regards, but we’re also in this together. I’ve benefited from 17 years as a professional animator, and have had an amazing career. This is because we have a thriving industry filled with curious, creative people always trying to push our medium forward. And we’re feeding a population that appreciates the work we do, supporting us. So the better off we all are, the healthier the industry as a whole becomes. And any competition that results from these efforts will just inspire me to continually improve in turn. These efforts feed themselves in the long run. At work, you and the team were really pushing the balance of visual fidelity and gameplay response on Destiny, and your bar-raising dance emotes were a great influence on Uncharted 4’s multiplayer dance moves. Who or what inspires you to push your work in game animation? I’ve been an avid Capcom fighting game player since Street Fighter II first hit US arcades. And since that time, the various Capcom fighters have been my biggest influence. I learned how to animate by dissecting the frame data of 3rd Strike. Many of my posing decisions are still influenced by Street Fighter. In Destiny, the Titan’s jumping rush melee is reminiscent of Adon’s rising knee attack. The hunter’s arc blade attacks were inspired by Strider from Marvel vs Capcom 2. But it’s not just the animation that I find inspiring. Fighting games are the perfect example of where animation and gameplay design intersect. No other style of game requires such a high level of interdependence to be successful. Fighting games need to be instantly responsive, but the characters need to feel robust and fluid. The solutions they’ve discovered have really influenced Destiny’s gameplay and animation, as well as the work we’re doing with Moss. More recently though, I’ve really been inspired by animation documentaries. One in particular is the PBS documentary on the life of Walt Disney. His dogged insistence that animation is an art form, advocating for the creative process with his animators, and leaning on them for their expertise. Seeing how he handled failure, and followed his dreams. I find it all immensely inspiring. Another good documentary is The Kingdom of Dreams and Madness. It follows Studio Ghibli during the production of the final film by Hayao Miyazaki. I can’t recommend it enough. What games are you playing right now – and what are your favourite games of all time? More importantly, have you seen your habits change over your career? My all-time favorite game is Street Fighter III: 3rd Strike. But I like to play a variety of games, and with the exception of loving my fighting games, my tastes are always changing. So, saying I’ve been playing Street Fighter V is a given. But I’ve recently completed Uncharted 4, which is a masterpiece for animation. Inside was also a recent favorite of mine. But the game I’m really blown away by recently is The Last Guardian. Trico is a watershed moment for game animation. He’s so incredibly believable, and changes my perception of what a game mechanic is. I’d never seen a game rely on the emotional state of a companion to communicate solutions to puzzles before. Trico is so immensely appealing, and I care about him on an emotional level. Granted, the game isn’t flawless, but what we have to learn from Trico is real. Also worth mentioning is Titanfall 2 for its rock solid gameplay. They’re really nailing the combat flow and feel with their responsive controls and outstanding animation. Firing their guns feel so good! Their 1st person parkour is so tightly tuned. Just the right amount of wall-stick, with animations that manage to sell those actions. It’s an amazing example of gameplay and animation benefiting from a symbiotic relationship. Can you tell us about your favourite or most memorable bug you’ve encountered during development? Are there any standout first-person arm explosions that might have occurred on an FPS? Oh man, there’s been so many! Everything from the Runtime Rig turning Destiny players into Slenderman to heads falling off of characters because the hat came off our mocap actor during a take. Recently at Polyarc, we were playtesting a prototype boss encounter for Moss. We wanted to test what it would be like to fight something much larger than our mouse, so we mocked up a box-monster. At one point in this encounter, the mouse needs to climb up on the monster’s hand, and attack an exposed weak point. Once the monster is damaged, he reels back and throws his hand into the air. Normally, the mouse would just slide off. But during a recent playtest, she was flung far off into the sunset miles away. Similar to bugs, the random human element of game development has always produced the best stories. What’s the best human story you have of game development? Heh, for sure! Back in my Monolith days when we were making Condemned 1, our lead designer, Frank would often suit-up in the spandex for some mocap performance examples. He liked to keep things as authentic as possible, so he insisted on real life props. Well, in Condemned, a real life prop meant a heavy lead pipe with red paint on one end. A few takes into the mocap session, he swung that pipe so hard he lost his grip on it. The pipe flew across the room and embedded itself into the wall. Frank was pretty damn strong. Often the most rewarding characters and moments are born of pain. What was the most difficult game creation you’ve ever had to bring to life and why? Destiny posed lots of challenges that most players would never even know about. 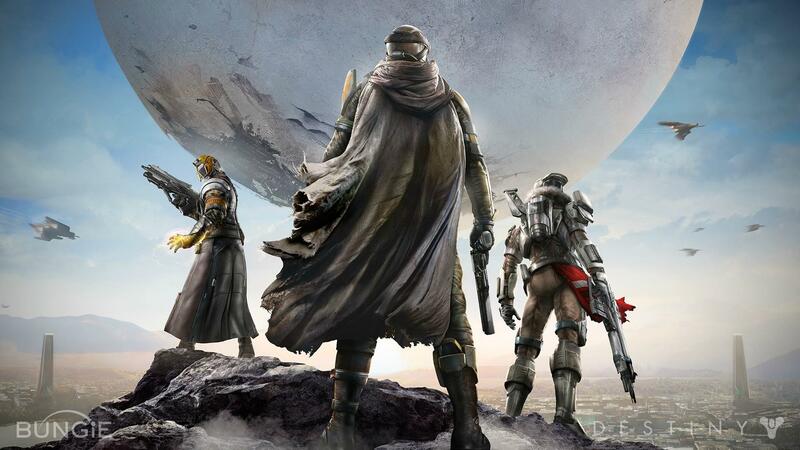 In Destiny, there was a wide array of possible weapons the player could hold. And with every update, the list of possible weapons would grow. The shape of the weapon. The size of the clip. Where the animated components were on the weapon. These were all considerations we needed to make. We needed to craft a set of 1st and associated 3rd person player animations that would look not just correct, but appealing while holding every weapon we could and would make. They also needed to look good in 3rd person while simultaneously aiming up 90 degrees, crouch-running diagonally back & left at a speed in between run & walk, blending out of a grenade throw, while firing, and starting a melee. All while remaining instantly responsive, yet fluid in motion. It took years, and lots of intelligent micro-solutions from numerous team members to make it all work. With your history of illustrating workflows and sharing knowledge on your vimeo channel, do you have any quick time-saving tips you use every day that might benefit game animators reading this? Learn what constraints do, and how to use them. Switching your relative space when animating is insanely powerful. And you can do this using simple constraints. For example, let’s say you’ve setup your rig, and started animating your character’s left hand in IK, relative to the chest. This is a great setting for when throwing a punch, but if you need to touch something in the world, you’ll be counter animating your chest motion to keep that hand in place. By creating a dummy object, constraining the dummy to the hand, baking that motion down, and reversing that constraint, you’ve switched that hand into world space while keeping your existing motion intact. No more reason to counter animate while the hand is touching something. And you can bake it down, returning that hand to chest space when you’re done animating that chunk of time. This is a very simplistic example of what constraints can do, but the more you take advantage of such power, the more complex the uses you’ll discover. As a veteran, what’s your biggest frustration in game animation (or game development as a whole) that you’d wish no longer existed? My biggest frustration? Well, I want to say the industry’s reliance on crunch, or possibly generic looking cartoony style animation. But the more I think about it, I’d have to say my biggest frustration is the lack of understanding regarding the differences between Film and Gameplay animation. Film animation is essentially about telling a story, and evoking emotion through the performance of its characters and camera. Gameplay animation is essentially about telling a story, evoking an emotion, and empowering a player through the use of its characters and camera. On the surface, they seem incredibly similar. But when you start digging into the details, there’s a vast gap between the two. That gap is interactivity. The actions of a player, and their perception of the world rarely fits into a linear narrative the way a viewer does in film. Simple things like, how do you make your hero feel like a hero when the player can run at a bush, fire a rocket at it, killing themselves? How do you ensure the player will see a pivotal story moment outside of a cinematic? These are just a couple examples of dozens I could call out. Story and emotions are generated in vastly different ways, and often require a completely different mindset to get right. There’s also a huge technical and gameplay design set of knowledge you’d need to be successful as a gameplay animator. Understanding how to make a punch, or fire a gun feel visceral and satisfying is complex. Not only do you need to understand the game engine and how to use it. But you need to understand gameplay mechanics, and what’s important to the feedback of the player. For example, a good punch isn’t as much about the anticipation in games as it is about the follow through. ‘What happened’ tells the story of your previous button press. Reactive gameplay requires the anticipation to be a fraction of a second, and is mostly just a pose with a short blend duration. While in film, foreshadowing the action with a strong anticipation is a valuable story tool. It takes years to learn the subtitles and differences of both. I’m firmly a gameplay animator. My film knowledge is slim, and I’m sure if I tried to cross over into film, there would be a big learning curve for me. Inversely, I’ve seen plenty of film animators try and cross over into the realm of gameplay without a proper understanding of the differences, only to have their work feel unresponsive, gummy, and sometimes unplayable. I’m not saying animators shouldn’t cross the threshold, but I do believe they should be open minded, respect the often vast differences, and seek out information that will enable success. Animation isn’t just animation. Perhaps with some unique insight as an animation instructor and career animator, what is the best advice you have for students wishing to stand out from the crowd to land a job, and succeed once they gain employment? Animation is the art of bringing characters and worlds to life. This requires more than just opening Maya or Max, and moving things around in time. Animation is about the thought behind the actions. What’s your plan? What’s your story? Who is your character? What’s important to you? How are you injecting yourself into your work? Are you planning an honest performance, or creating a cliche? I’ve noticed that so many animators starting out are so focused on the execution that they forget to imagine their character as a living being. And it’s easy to get lost in the process. It still happens to me at times, and I’m sure I’m not alone. The trick is to plan your steps, and not to get distracted. First, have a well considered plan. Be sure your idea will inspire others, and not just be something to do. Create some sketches if you need to, just be sure your plan is bulletproof. Next, find quality reference either by recording yourself, or finding suitable footage/images. Then, when you’re doing your core posing, work in stepped. It’ll help you focus on the poses without being distracted by the motion. Remember, your core posing is your performance, not your curves. Finally, use your curves to strengthen your performance, not define it. If you’re trying to find your performance in your tweens, you’ve skipped a step or two. We’ve survived and thrived in the move from 2D to 3D, widespread adoption of mocap and recently performance-capture, and are potentially on the cusp of the great unknown of VR. What do you see as the future for game animation, and what will be the game animator’s role in the future? Oh, I love this question. All the tools and tech I’ve worked on or used in the past have been to help achieve a more believable performance. Because the more believable the performance, the more we can draw on the player’s emotions. The better we can tell a story. My body mechanics scripts, the Runtime Rig, Mocap, these all exist to service this goal. Now with VR & AR, we’re presented with a whole new opportunity to create realism in our characters. No longer are they flat images moving around a screen being controlled with a game pad. But they’re in our world in ways we’ve never experienced before, and we can interact with them in more human ways. VR/AR is still very, very new. It’s a technology that’s rapidly evolving, as us content creators are figuring out how to use it. But this new technology suddenly changes the rules for us as animators. Previously, seeing a character pop, blend, or wobble due to the way gameplay samples would solve and blend together was acceptable. A history filled with representational animation to support gameplay systems is an expectation. Even films such as Wreck it Ralph would intentionally recreate these anomalies to help make it feel more like a video game. But this isn’t a value of games. It’s a side effect of the technology, and the abstract nature of interacting with our characters. Like I said, they’re moving around a flat TV, and we’re interacting with a control pad. But when you see a character do these things in VR/AR, it reminds the user they’re playing a game, taking them out of the experience. It’s suddenly a problem we can no longer accept as a given. Many of the current crop of VR/AR games highlight this. And many developers are working around the issue by avoiding characters. Or they’re adding robots instead of organic creatures. Or they’re limiting interactivity so they can craft the performances. But we’re eventually going to need to tackle this issue head-on. “Authenticity”, this is the future of character animation. Over the next few years, we’re going to start seeing teams really make headway in this regard. VR/AR will be the catalyst, but the solutions will benefit all games. Animators will gradually morph into actors. The process of animation authoring will evolve to simplify much of the manual processes that can lead to less-than-ideal results, allowing the animator to focus more on the heart and story for their performances. There’s a huge opportunity for Autodesk, or a competitor to make the next great animation authoring tool set. Such tools as real-time, multi-space solving for a given animated object using a wizard UI to help the animator understand the optimal, contextual working space. Tools that will make body mechanics much easier to achieve without mocap, utilizing locomotion learning systems and physics simulations. Tools which will integrate directly with the engine, bridging the gap between authoring and implementation with an intuitive UI. Game engines will evolve their systems and interfaces, allowing for much more complex and stable methods of clip interaction. Allowing for maximum interactivity without the need for linear performances. It all comes down to bringing believable characters to life. It’s why I’m so impressed with Trico from The Last Guardian. Imagine how powerful that performance would be in VR! As this industry evolves, the quality of Trico’s performance will become the expectation instead of the high-bar. Finally, is there anything that we might have missed that you’d like to cover? The crew here at Polyarc and I are very excited to announce our first game. We’re currently working hard on the world of Moss, and getting ready for a big reveal soon. We hope that you’ll enjoy the work we’ve been doing, and are excited to have you join us in our VR world!